Manufacturer of a wide range of products which include hydrogen gases. We offer a wide range of Hydrogen Gas, that are used in varied industrial applications. Our range encompasses oxygen, hydrogen, nitrogen, argon, nitrous oxide, carbon monoxide, helium, compressed air, medical oxygen and many more. 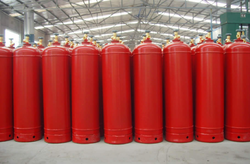 Procured from reliable manufacturers, these industrial gases are known for their purity and are in adherence with prevalent industrial standards.